So, just how good a machine is this? Well, roll out its ample collection of "Bike of the Year" awards** and 125 Supercross titles***, for starters. 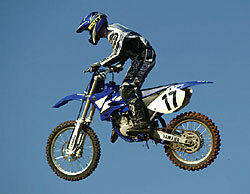 Then put an exclamation point on it with this bit of news: The YZ125 is poised to raise the bar to even newer heights. Commence in the engine room, where broader, more usable power and crisper throttle response is on tap across the rev range, thanks to reshaped exhaust porting and combustion chamber volume, a modified YPVS power valve, all-new reed-valve petals and revamped carb settings. And, like its YZ250 sibling, lighter, more responsive chassis performance comes via a lighter-weight swingarm and stiffer frame, revised fork and shock internals, light Excel rims, and lighter, stronger brakes. 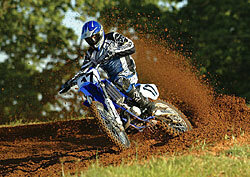 "The YZ125 is a major weapon that's very easy to ride. It's fast, responsive and razor-sharp, with punch out of ruts that's almost unreal. 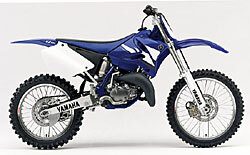 The YZ125. Perfecting performance to an art form. Liquid-cooled, 124cc, reed valve-inducted 2-stroke engine. Lightweight, compact and boasts numerous modifications and upgrades for 2003 for stronger, harder-hitting power across the entire RPM range. All-new cylinder construction includes reshaped combustion chamber volume and porting, along with revised port timing, for bigger mid-range hit and top-end power with greater over-rev capacity. Yamaha's patented YPVS system features all-new valve stopper to improve exhaust power valve sealing and thus enhance low-rpm power delivery. Revised carburetor settings and air screw positioning ensure more precise air/fuel metering, crisper throttle response and enhanced low-rpm performance. Straighter carburetor manifold provides more direct airflow, improving intake efficiency for optimal air/fuel mixing. · New-design reed valve is 0.05mm thicker for stronger high-rpm performance with greater over-rev capacity. Smooth-shifting, 5-speed, close-ratio transmission with heavy-duty, multi-plate clutch features revised 1st and 2nd gear ratios to ensure optimal low-speed hook-up for outstanding acceleration and corner-exiting power. All-new, high-tension steel, twin-spar frame is lighter with greater lateral rigidity by way of a stronger main pipe and thinner-walled cross-pipe. Revamped front fork internals and revised settings mean smoother oil flow and enhanced damping performance. Rear suspension refinements for 2003 include new shock absorber settings with revised linkage ratios for enhanced damping performance in conjunction with new swingarm. Redesigned swingarm has lighter-weight construction to reduce overall weight while enhancing suspension performance, and features anodized finish for added durability and styling. All-new, lighter-weight front and rear calipers with aluminum pistons and new-design rear master cylinder, combined with 250mm fully floating front and 245mm rear disc, deliver stronger stopping power with greater, more progressive control and feel. Redesigned chain guide and cover help shave weight while improving mud removal abilities. All-new handlebar design with repositioned crossbar provides greater strength and durability. Digital CD ignition system delivers precise spark and monitors engine speed to ensure optimal timing for faster, stronger response during hard acceleration. Large-capacity radiator features a 10-row core with 4 louvers to deliver maximum cooling efficiency at all performance levels. Exhaust pipe with special-design silencer features a tapered section for broader power delivery with stronger low-end hit for maximum corner -exiting muscle. Primary kickstarting ensures easy restarts in any gear. Trick, works-style clutch lever features race-spec barrel adjuster for on-the-fly adjustability. Removable aluminum rear subframe constructed of square-section pipe for reduced weight. Lightweight 46mm inverted Kayaba cartridge fork features 11.8" of travel with compression and rebound damping adjustability. Low-friction outer tubes and aluminum piston rods ensure smoother, more compliant fork stroke for superior handling and lighter steering. Rear suspension system features fully adjustable Kayaba shock with 12 .4" of travel and separate adjusters for high- and low-speed compression damping. Lightweight 21" front and 19" rear Excel rims provide exceptional durability and help reduce unsprung weight for optimal suspension performance and handling. Premium Dunlop 739 knobbies offer unbeatable, race-spec traction and excellent wear. Special-design flat seat and fuel tank, forward-canted steering crown and low handlebar all help create greater freedom of movement and more comfortable ergonomics for riders of all sizes. Wide-diameter fuel tank cap ensures easier usage, while larger tank opening means faster, hassle-free refueling. · Wide, cleated, folding cast alloy footpegs provide excellent comfort, grip and ground clearance. Cleated rear brake lever and folding shift lever tip offer superb grip and exceptional durability. Stainless steel clutch cable for longer life.